Email Ray Banks if you find any broken links on this page. 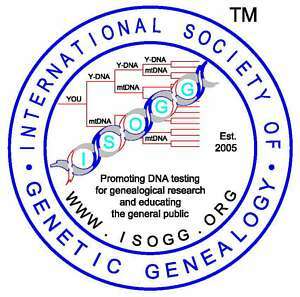 The ISOGG SNP Index web page lists the SNPs which are either on the ISOGG Y Haplotree or that are or have been under active investigation and consideration for addition to the Y Haplotree. The SNPs listed here are less than 20% of the currently known SNPs. The top of the spreadsheet has a link to YBrowse, which is primarily a listing of all known shared human Y-DNA variants maintained by Thomas Krahn. Only some of these are in the ISOGG tree. Some do not qualify. To do look-ups in YBrowse: In the Search Box under Landmark or Region on the left hand side of the page, you can type a SNP name such as M222, or a position such as chrY:14002414..14902414, then click on the Search button. When the search is complete, the SNP name appears under the Detail section. If you click on the SNP name in the Detail section, you will get a new window which shows the SNP mutations and other information. Click here to open YBrowse directly. Use the link to YBrowse for updated rs-numbers (if any) and context on mutations. Use the link to the NCBI database for more information on rs-number sites. Y Chromosome Consortium, A Nomenclature System for the Tree of Human Y-Chromosomal Binary Haplogroups. Genome Research, 12: 339-348, 2002. Added BY92692, BY109995, BY148259, BY148261^^, BY151424^^, Y63991, Y68368, Y70581, Y71567, Y71733, Y73829, Y74920, Y75388, Y75507, Y76039, Y79631, Y89942, Z40472, Z40473 to tree; added BY197979, BY198162, BY198184, BY198219, BY198323, BY198435, BY198443, BY198797, BY198881, BY198934, BY198942, BY199075, BY199216, BY199261, BY199390, BY199394, BY199539, BY199589, BY199671, BY199785, BY199800, BY199804, BY199976, BY200133, BY200239, BY200562, BY200663, BY200889, BY200900, BY200961, BY201043, BY201105, BY201170, BY201207, BY201359, BY175888, BY198170, A21943.2, BY139447, BY198414, BY198429, BY198623, BY198639, BY198833, BY198865, BY198939, BY199045, BY199163, BY199328, BY199669, BY199757, BY200031, BY200268, BY200270, BY200300, BY200379, BY200488, BY200607, BY200659, BY200834, BY200889^^, BY201050, BY201107, BY201181, BY201187, BY201218, BY201396, F20214.2, Y43979.2, ZS4719.2, BY63635/MPB374, BY104139/MPB378, BY106469/MPB380, BY186297/Y160383, BY186309/Y160461, BY186359, BY186500/Y160431, BY186697/Y160437, BY187115^^/Y160390^^, BY187238/Y160460, BY187416/Y160369, BY187593/Y160433, BY188137/Y160470, BY188207/Y160461, BY188218/Y160464, BY188575/Y160467, BY197506/Y160407, F12439, BY119912, BY197326, BY197512, BY197618, FGC56398.2/Z42724.2, BY197252, BY197432, BY197775/Y160415 on 1 January 2019. Added BY200867, BY67935/MPB375, BY70269/MPB376, BY73594/MPB377, BY105909/MPB379, BY108371/MPB371, BY117222/MPB382, BY125350/MPB383, MPB373.2/Y143290.2, BY118088/MPB385, BY101946/MPB184 on 2 January 2019. Added A11149.2, FGC87976, FGC87977^^, FGC87982^^, FGC87985, FGC87986, FGC87987, FGC87988, FGC87989.2/MF24301.2, FGC87990, FGC87991, FGC87994, FGC87995, FGC87996, FGC87997, FGC87998, FGC87999^^, FGC88000, FGC88002, FGC88003, FGC88004, FGC88005, FGC88006, FGC88007, FGC88008, FGC88009, FGC88012, FGC88013, FGC88014, FGC88015, FGC88016, FGC88017, FGC88018, FGC88019, FGC88020, Y164004, Y164012 on 3 January 2018. Added BY202470, BY202488, BY202564, BY202592, BY203053, BY203054, BY203147, BY203301, BY203624, BY203643, BY203645, BY204053, BY204057, BY204089, BY204248, BY204429, Y190, Y19318 on 4 January 2019. Added FGC257, FGC247 to tree; added FGC42908, FGC42910, FGC42912^^, FGC56390, FGC54603, BY203772, BY203810, CTS6808.2/M4839.2, FGC254, Z3567 on 5 January 2019. Added BY79219, FGC63509, FGC63510/Z44104, FGC63511/Z44105, FGC63512/Z44106, FGC63513/Z44107, FGC63514, FGC63515, FGC63516, FGC63519/Z44108, FGC63520, FGC63521, FGC63523, FGC63524, FGC63525, FGC63526, FGC63527, FGC63528, FGC63529, FGC63530, FGC63531, FGC63533, FGC63534, FGC63536, FGC63537, FGC63538, FHC63539, FGC63540, FGC63541, FGC63542 on 6 January 2019. Added BY21806, BY21807, BY47628/FGC78410, BY47726/FGC78411, BZ1440.2/FGC65128.2, FGC65077, FGC65091^^, FGC65093, FGC65097, FGC65098, FGC65100, FGC65101, FGC65103, FGC65106, FGC65107, FGC65111, FGC65115, FGC65116, FGC65124, FGC65125, BY74777, BY100887, BY112376, BY134626, BY135393, BY142506, Z12675.3 on 7 January 2019. Added BY158135, BY204679, BY204684, BY204723, BY204737, BY204741, BY204823, BY204828, BY204908, BY204945 on 8 January 2019. Added BY37100, BY37105, BY57523^^/Y150367^^, BY69733/Y150430, BY75576, BY78682^^/Y150435^^, BY81803/Y150357 on 9 January 2019. Added BY49593, BY202345, BY202366, BY202375, BY202430, BY202443, BY202450^^, BY202517, BY202559, BY202563, BY202578, BY202580, BY202643, BY202672, BY202681, BY202697, BY202731, BY202773, BY202787, BY202799, BY202800, BY202818, BY202851, BY202902^^, BY202985, BY203044, BY203062, BY203174, BY203237, BY203271, BY203272, BY203426, BY203467, BY203536, BY203650, BY203700, BY203708, BY203740, BY203753, BY203770, BY203781, BY203836, BY203837, BY203855, BY203911, BY203914, BY203940, BY203985, BY204001, BY204043, BY204153, BY204256, BY204338. BY204361. BY204403, BY204445, BY204450, BY204505, BY204509, BY204517^^, BY204529, BY204625.2/MF3595.2, M12121.2, Y95492, Y139844.2, ZS8908.2 on 9 January 2019. Added BY203334, Z29972.2, BY204381, BY165438, BY165597, Y16169, BY21363.3/ZS5999.3, Y45738, Y48489, Y53157, Y53746, Y57329, Y81219 on 10 January 2019. Added BY164642, BY165581, BY56242, BY61896, BY68123, BY76079, BY197004^^, BY197735, BY197380, BY186341, BY187237, BY187277, BY187643, BY187659, BY187666, BY187873, BY187898, BY187952, BY188013, BY188140, BY188250, BY188490, BY196903, BY197115, BY197634, BY197644, Y26017.2.2/Z42076.2, FGC55702, Y82047^^ on 11 January 2019. Added BY75857.2, BY202346, BY202354, BY202364, BY202608, BY202614, BY202617, BY202666, BY202677, BY202749, BY202840, BY203125, BY203234, BY203246, BY203346, BY203435, BY203487, BY203524, BY203697, BY203711^^, BY203712^^, BY203738, BY203775, BY203938, BY203979, BY203980, BY203993, BY204030, BY204031, BY204104, BY204118, BY204157, BY204244, BY204286, BY204379, BY204457, BY204539^^, MF10318^^ on 13 January 2019. Added BY37106, BY37096, BY37099, BY37104, BY37107, BY37108, BY37109, BY37110, BY37117, BY37119, BY205504/Y164023, BY207765, BY207748, BY70232, BY81897, BY92788, BY101966, BY110482, BY114592, BY125186, BY144062, M10821, Z45675, Z45719, ACT685^^, ACT964^^, ACT992^^, ACT1010^^, Y147612, Y147621, Y147636, Y147671, Y147706, Y147774, Y148063, Y148069, Y148439, Y148443, Y148472, Y148502, Y148522, Y148525, Y148582, Y148599, Y148635, Y148645, Y148657, Y148666, Y148690, Y148716, Y148801, Y148807^^, Y148830, Y148867, Y148891, Y148940, Y149032 on 14 January 2019. Added BY80574, YP311, S18681 on 15 January 2019. Added BY187256, BY187313, BY188651^^, Added A23875, F20634, MF6492, MF6513, Y156896, ACT6493/Y161872, ACT6538/Y161858, ACT6800/Y161897, ACT6807/Y161895, ACT7006/Y162011, ACT7096/Y161945, ACT6705/MF41330, ACT6715/MF41673, ACT6999/MF50853, BY47757, MF6458 on 16 January 2019. Added BY55287, BY113046, BY135463, BY138899, BY186889^^ to tree; added BY156352, BY186203, BY186459, BY186648, BY186804, BY186989, BY187175, BY187217, BY187384, BY187420, BY187470, BY187615, BY187713, BY187775, BY188130, BY188131, BY188134, BY188172, BY188576, BY188678^^, BY188701, BY188034, BY97984, BY104373, BY106223, BY107962, BY116986, BY120091, BY124289, BY131191, BY134588, BY139164, BY141186, BY143371, BY156748, Z31328, Z31331, BY205841, BY205921, BY206089, BY206560, BY206762, BY207498, BY207876, BY208209, BY208340, BY209052^^, PH517, BY93576, BY94390, BY95730, BY105917, BY112876, BY113187, BY141277, BY74527, BY105170, BY144107 on 17 January 2019. Added ALK539.2/FGC80516.2, BY90365, FGC36370^^, FGC36371, FGC36373, FGC36374, FGC36375, FGC36378, FGC36379, FGC36380, FGC36381, FGC36382, FGC36383, FGC80513, FGC88330/BY198078, FGC36368/Z36162, FGC36376, FGC80517, BY208040/FGC88328, ACT263 on 18 January 2019. Added FGC50437, FGC64911, FGC64912, FGC64913, FGC64914, FGC64915, FGC64916, FGC64917, FGC64918, FGC64919, FGC64920, FGC64921, FGC64922, FGC64923,FGC64924, FGC64926, FGC64927, Z5809.2, Z43090, Z43091, Z43092, Z43093, Z43094 BY205607. BY205667, BY205767, BY206002, BY206147, BY206167, BY206210, BY206250, BY206278, BY206646, BY206802, BY206804, BY207335, BY207817, BY207881, BY207968, BY208783, BY2088784, BY209023, FGC60920BY207806 on 20 January 2019. Added Z43083, FGC60934, FGC60936^^, FGC60944, FGC60945, FGC60947^, FGC60948^, FGC60950^, FGC60951, FGC60958, FGC60960, FGC60961, FGC60963, FGC60964, FGC60966, Z43081, Z43082, Z43084 to tree ; added FGC60946, FGC60962, FGC60954, FGC60957, BY123198, Y70685, Y80728, Z15364.2, Z43080 on 21 January 2018. Added FGC7263, FGC7282, FGC7284, FGC7285, FGC7286, FGC7287, FGC7289, FGC7290, FGC7291, FGC7303, FGC7308, FGC7319, FGC7311, FGC7313, FGC7318, FGC7321, FGC7326, FGC7327, FGC7329, FGC7330, FGC7331, FGC7333, FGC7336, FGC7345, FGC7347, FGC7348, FGC7349, FGC7350, FGC7351, FGC7358, FGC7359, FGC7361, FGC7362, FGC7363, FGC7364, FGC7367, FGC66789^^ for tree; added BY205548, BY205641, FGC81988, BY207175, FGC81989, FGC81990, BY208880 on 22 January 2019. Added ACT6496/Y162833, ACT6767/Y162772, ACT6809/Y162762, ACT6952/Y162792, ACT7125^^, MF3261, MF5811^^, Y162790, ACT33^^, ACT49^^, ACT69^^, ACT177^^, ACT213, ACT248, ACT256, ACT264, ACT309, ACT336, ACT343, ACT745/Y135644, ACT763^^, ACT1321, ACT1368/Y135628, ACT1661/Y135628, ACT1735/Y135629, ACT1819/Y135632, FGC66385^^ on 22 January 2019. Added Y141171^^, Z46455^^, Z46456^^, Added BY74567, BY77957, BY86939, BY99191, BY106198, BY110827, BY112950, BY118528, BY119900, BY124420, BY124688, BY131394, BY133206, BY141490, BY151009, BY205995, BY206838^, BY207377, BY209045^^, BY61896/Z45956, BY93013, BY98583, BY135882, BY150959, Z31686.2 BY205507, BY206456^^, BY207763, BY207948 on 23 January 2019. Added BY150483, BY153298, FGC59077, Y155740, Y155745, Y155747, Y155752, Y155754, Y155767, Y155768, Y155773, Y155785, Y155790^^, Y155805, Y155806, Y155808, Y155812, Y155813, Y155822, Y155825, Y155834, Y155835, Y155845, Y155847, Y155849, Y155854, Y155861, Y155868, Y155871^^, Y155878, Y155879, Y155883, Y155891, Y155894, Y155900, Z46457^^, Z46458^^, Z46459^^, Z46460^^, Z46461^^, Z46462^^ on 24 January 2019. Added F105, F188^^, F550, F685^^, FGC12474/SK1674/Y3272, CTS858, CTS9415, F119, FGC12468/Y3284, FGC12473/F611/Y3278, MF1094, MF1095, MF1096, MF1107, MF1108, MF1109, MF1145, ZS12569.2 MF8613, SK1676, FGC60773, FGC60775, FGC60776, FGC60777, FGC60796, FGC60811, MF6982, MF6983, MF6984, MF6985, MF6986, MF6987, MF6988, MF7030, MF7032, MF7046, MF7051, F13136, MF7062, MF7063, MF7064, MF7065, MF7066, MF7120, MF7121, MF7122, MF7123, MF7124 MF1237, MF1239, MF1240, MF1241 on 25 January 2019. Added MF14538, MF15136, MF15342, MF16785, MF16203, M20726/Y157649, Z7776.2, MF16427, MF16500, MF21617, MF22364, Y111707.2, Z46463 on 31 January 2019. Added CTS8537, CTS1621, F18858, Y141175, Y141213, Y141252, Y141275, MF7453, Y65006, Y97194, A22940, A22941, MF30934/Y151758, MF31684/Y151809, MF51320/Y151825, Y150436, CTS10514, F23571, F931, F1455, F2154, F2255, F2770, FGC65999^^, FGC66006^^, Y21445, FGC66016, FGC66017, FGC66019, FGC66020, FGC66021, FGC66030, FGC66032, FGC66036, FGC66037, FGC66039, FGC66040, FGC66042, FGC66045, Y87030, MF6724, MF6725, MF6726, MF6728, FGC23704, Y52313, CTS7271, MF6739, MF6740, MF6754, MF6755, FGC1419/Y9188, MF6765, MF6766, MF6767, MF6768, MF6769, MF6770, MF6771, F16340, M6779, M6780, M6781, PH83, PH2418 on 1 February 2019. Added FGC12502, A22321, FGC12487, FGC12505, FGC12506, MF6804, Y128662, FGC12485, FGC13504, MF6805^^, MF6806, Y128070 F2405 on 4 February 2019. Added A22322, A22323, F806, F1272, F1488^^, F2128, F3575, F3589, FGC12479, FGC12489, FGC12495, MF6815, MF7669, MF6807, MF6808, FGC33600, MF6809, MF6810, MF6811, MF6812, MF6813, MF6814, A7966/BY987, MF15642, BY42738^^, MF7684, MF7764, MF7773, MF15180, MF14988, MF15920, MF46495, MF50249, MF51634, MF7704, Z46464, F2091, F2375, F2622, F2931, F3332, MF14553, MF15671, MF16395, MF14857, MPB069.2/Z19477.2, MF7721, MF7732, MF14959, MF15040, MF15182, MF7673, MF7692, MF7693, MF7818, MF7827, MF7850, MF7716, A22622^^, A22623, MF7678, MF7836, MF7837, BY68984, MF15205, MF15302, MF16715, MF7664, MF7665, MF7767, MF7768, MF7824, MF6816, MF6818, MF6819, MF6820, MF6821, MF6826, MF6836, MF14171, MF14334, MF14418, MF14430, MF14466, MF14782, A10289, FGC8985, M6392, MF6841, MF6842, MF7683, MF7711, MF7719, MF7729, MF7761, MF7780, MF7785, MF7844 on 5 February 2019. Added BY55658, BY56245, BY94960, BY97502, BY116195 on 9 February 2019. Added FGC51451, FGC51463 on 10 February 2019. Added BY28075/Y82414, BY28077/Y84165, BY28079/Y86068, BY28080/Y86820, BY28082/Y88704/, BY28085, BY28089/Y90893, BY28091/Y91876, BY28092/Y92317, BY28093/Y92693, BY28094/Y93828, BY28095/Y95756, BY28096/Y96312, BY28099/Y97779, BY28101/Y101149, BY28103/Y102125, BY28104/Y102559, BY28106/Y103631, BY28107/Y103949, BY28108/Y104064, BY28128/Y107930, BY28129/Y108224, BY28130/Y108341, BY28179/Y109337, BY28180/Y110699 on 11 February 2019. Added A16570.2, BY169006, BY169063^^, BY169344, BY169600, BY169825, BY169863, BY169966, BY170142, BY170211, BY170231, BY170382, BY170511, BY170556, BY170815, BY170860, BY170943, BY171068 on 12 February 2019. Added BY10972, BY56083, BY182964, V1482.2, Y62556.2, Y83023.2, Z3442^^ on 21 February 2019. Added Y46258, F15966, F22504, MF6915, MF6916, MF8048, MF8070, MF6932, MF6933, MF6934, MF6935, MF6936^^, MF6937, MF6938, MF6939, MF6940^^, MF6974, MF6975, MF6976, MF6953, MF6954, MF6955, MF2463^^, FGC54505, FGC54526, MF8087, MF8098, MF2473, MF2474, ACT2777, ACT2793, MF2464, MF2465, MF9483, MF9489, MF9486, MF9487, MF9488, Y163866, Y163727 MF8460, MF8464^^, Y138891 on 22 February 2019. Added Y142552.2 to tree investigation on 24 February 2019. Added FT6731, FT6735, FT6754, FT8508, FT8947, FT8966, FT8992, FT9233, FT9525, FT9615, FT9670, FT9684, FT9755, FT9788, FT9989, FT10136, FT10238, FT10308, FT10323, FT10410, FT10514, FT10658, FT10739, FT10823, FG10866, FT10957, FT11397, FT11406^^ FT3449, FT4878, FT4935, FT4953, FT5176, FT5191, FT5471, FT5975, FT6200, FT6550^^ on 25 February 2019. Added FGC40498, FGC46784 to tree; added A23966, A23970, A23978, A23979, Z23980, FT4580^^, FT4637, FT4704^^, FT4734^^, FT4851, FT4888, FT5453, FT5781, FT6425, FT6504, FGC87806, M9313.2, Y15858, Y165180, Y165280^^ on 26 February 2019. Added FGC51303, FT8410, FT8413, FT8491, FT8655, FT8674, FT8690, FT8766, FT8769, FT8774, FT9136, FT9160, FT9217, FT9336, FT9366, FT9772, FT9784, FT9808, FT9872, FT9897, FT10128, FT10214, FT10281, FT10553, FT10669, FT10903, FT11019, FT11025, FT11072, FT11092, FT11135, FT11179, FT11326, FT11374, FT11401^^, MF44516.2, PH1297, Y29332.2, Y125890, Y131893.2 BY78358, BY163577/Y153546, BY163579/Y153512, BY163659/Y153503, BY163660/Y153550, BY163685/Y153505, BY163768/Y153518, BY163845/Y153500, BY163905/Y153570, BY163906/Y153548, BY164032/Y153542, BY164166/Y153532, BY164211/Y153517, BY164312/Y153525, BY164336/Y153496, BY164351/Y153558, BY164403^^, FT8887^, V2154, Y76221.2, Y83448, Y152275^, Y153509, Y153529, Y153569 Y5034 on 28 February 2019. Added Z37567.2^^, Y134554, Y134556, Y134557, Y134558^, Y134559, Y134560, Y134562, Y134563, Y134564, Y134565, Y134567, Y134568, Y134569, Y134570, Y134574, Y134575, Y134576, Y134577, Y134573 on 1 March 2019. Added Z22424.2, Y134506, Y134561 to tree investigation, added Z36567.2^^, Y134555 on 4 March 2019. Added FGC42523, Y25196, Y25198, Y25199, Y25200, Y25201, Y25202, Y25208, Y25217, Y25220, Y25221, Y25222, Y25227, Y25232, Y25235, Y25236, Y25237, Y25240, Y25242, Y25244, Y25245, Y25247, Y25258, Y25259, Y25260, Y25262^^, Y25263^^, Y25264^^, Y25266, Y27081, Y27082, Y27086, Y27101^^, Y27102, Y27107, Y27111, Y27113, Y27119, Y27126, Y27131,Z31906^^, Z31934^^, Z31967^^, Z32004 on 9 March 2019. Added Z31932^^, Z31933^^, Z31937^^, Z31938^^, Y25214, Y27108, Y25226, Y25228, Y25234, Y25238, Y27120, Y27122, Y25241, Y25249, Y27135, Y25255, Y27138, F26454^^, Z32050^^, Y25270^^, F26347^^, Y27100 to tree; added Y25191, Y25207, Y25230, Z31947^^ on 10 March 2019. Added BY77937^^, BZ1904.2, FGC38473, FT11451, FT12484, FT12578, FT12593, FT12640, FT12647, FT12668, FT12774, FT12932, FT12987, FT13016, FT13251, FT13325, FT13442, FT13514, FT13558, FT13697, FT13726, FT13740, FT13755, FT13799, FT13823, FT13884, FT13898, FT13918, FT13942, FT14083, FT14144^^, FT14186, FT14213, FT14268, MF34117.2, Y15172.2, FT13007, FT13695, FT14054 on 11 March 2019. Added FT8762, FT8773, FT8788, FT8914, FT9141, FT9294, FT9454, FT9580, FT9700, FT9957, FT10165, FT10274, FT10506, FT10623, FT10651, FT10736, FT11140, FT11271^^ on 12 March 2019. Added BY197979, BY198162, BY198184, BY198219, BY198323, BY198435, BY198443, BY198797, BY198881, BY198934, BY198942, BY199075, BY199216, BY199261, BY199390, BY199394, BY199539, BY199589, BY199671, BY199785, BY199800, BY199804, BY199976, BY200133, BY200239, BY200562, BY200663, BY200889, BY200900, BY200961, BY201043, BY201105, BY201170, BY201207, BY201359 on 13 March 2019. Added BY79192, F7420/FGC16468/Y4641, F11235^^/FGC28876^^, F11383/FGC28883, F12031/FGC16419/Y4586, F12730/FGC16463/Y4615, FGC28967^^, FT59, FT14549, FT18932, FT19258, FT19840, FT20071, FT22097, FT22208, FT22342, FT22806, FT23331, FT23393, FT23681, FT24753, FT25056, FT25064, FT25322, FT26195, FT26277, FT26395, FT26741, FT26832^^, MF10337, MF10415, MF48653, FGC28884, F13958^^/FGC28968^^ to tree investigation on 17 March 2019. Added BZ1778.2 on 18 Mar 2019. Added BY21462, BY21463, BY21465, BY123762, Y49510, Y52538, Y53004, Y56902, FT19224, FT23935, FT24368, BY126500, Y49088, Y53555, Y56044, Y56182 on 19 March 2019. Added FT18864^^, FT19555, FT19778, FT20799^^, Y138490.2, Y164204 on 20 March 2019. Added FT33869, FT33960, FT34207, FT34439, FT34613, FT34642, FT35038, A21258.2, BY129306, BY146155, FT18710, FT18827, FT18879, FT19053, FT19336, FT19473, FT19575, FT19602^, FT19733, FT19786, FT19832, FT19854, FT19999, FT20323^^, FT20414, FT20533, FT21154, FT21189^, FT21272, FT21473^^, FT21653, FT21772, FT21857, FT21955, FT22224, FT22367, FT22636, FT22752, FT22854, FT22936^, FT23049, FT23140, FT23414, FT23449, FT23619, FT23675, FT23950, FT23959, FT24116, FT24283, FT24603, FT24766, FT25026, FT25378^, FT25500, FT25937, FT26043, FT26057, FT26557, FT26755, FT26760, FT26883^^, FT27007, MF1010.2, Y105954.2, FGC7292 on 21 March 2019. Added FT12114^^, FT12508, FT12699, FT13160, FT13199, FT13327, FT13328, FT13452, FT13485^, FT13533, FT13657, FT14004, FT14005, V7991.2/Y27517.2, Y86896, Y87806, Y92536, Y93425, Y94584, Y103333, Y105464^, Y107131, Y110694, Y112447^^, Y32597, Y32598, Y32599, Y32922, Y32600, Y32920, Y32602, Y32921, Y326035, Y32604, Y32605, Y32924/, Y32923, Y32606, Y32609, Y32610, Y32611 on 23 March 2019. Added FT8300, FT8464, FT8790, FT8795, FT8867^^, FT9007, FT9539, FT9612, PF9681, FT9701, FT9884, FT10117, FT10279, FT10517, FT10523, FT10821, FT10855, FT10943, FT11094, FT11119, FT11213, FT11217, FT11218, FT11219, Y147813,2 on 24 March 2019. Added BY96506, BY129165, FT14587. FT18800, FT18875, FT19244, FT19330, FT19700, FT19709, FT19904, FT19955, FT20152, FT20318^^, FT20388, FT20479, FT20945, FT21388, FT21481, FT21783, FT22041, FT22092, FT22126, FT22193, FT22315, FT22374, FT23116, FT23245, FT23251, FT23260, FT23360, FT23379^^, FT23533, FT23620, FT23673, FT23790, FT23855, FT24537, FT24673, FT24804, FT25286, FT25467, FT25573, FT25680, FT25868, FT25899, FT26211, FT26271, FT26512, FT26642, FT26724, FT26769, FT26937, FT27016, MF31946.2^^, Y 24921.2, Y33595, Y50709.2, FT20364^^, Y84979.2 on 25 March 2019. Added FGC7476/S16502/Y312 on 26 March 2019. Added A14661.2, A21433.2, BY153677, FT11433, FT12555, FT12576, FT12637, FT12669, FT12679, FT12724, FT12732, FT12751, FT12776, FT12970, FT12994, FT13005, FT13059, FT13196, FT13214, FT13236, FT13237, FT13308, FT13336, FT13354, FT13390, FT13426, FT13428, FT13447, FT13484, FT13508, FT13517, FT13582, FT13764, FT13780, FT13784, FT13816, FT13888, FT14006, FT14022, FT14094, FT14183, FGC89032, FGC89069, MF6278.2, MF42908.2, FT12780, Y145390.2 on 27 March 2019. Added Z31698, ACT1924/BY75034, ACT1942/BY101096, ACT1956/BY108665, ACT1978/BY122771, ACT1990/BY138679, ACT1992/BY55394, ACT1996/BY157129, ACT1997/BY145927, ACT5200, BY61579, BY63976, BY64411, BY64590, BY67883, BY68092, BY68143, BY68685, BY69578, BY71536, BY72074, BY72441, BY74403, BY74835, BY75269, BY75527, BY93466, BY94670, BY94766, BY96712, BY98339, BY98647, BY100015, BY101611, BY102059, BY102104, BY102669, BY102754, BY103730, BY105028, BY107916, BY108315, BY109774, BY109285, BY109854, BY112686, BY112753, BY114664, BY114950, BY117004, BY11773, BY118242, BY119765, BY120772, BY130394, BY131468, BY132156, BY132917, BY133344, BY134307, BY134431, BY134786, BY135648, BY136517, BY138280, BY1389100, BY139183, BY142966, BY143272, BY143786, BY144548, BY147150, BY212443, FT124075, FT18766, FT19079, FT19121, FT22034, FT23214, M6882, FT18748, FT18793, FT19347, FT19444, FT19471, FT21050, FT21124, FT21672, FT22402, FT22406, FT22451^^, FT22677, FT22828, FT23262, FT23707, F24026, FT24686, FT25177, FT26088, FT26095, Y54024.2 on 30 March 2019. Added T23713.2/MF73959.2, FT24217, FT25023 on 31 March 2019. Added BY161759, BY161708, BY162203, BY162304, BY162533, BY162618, BY162760, BY162874, BY163020, BY163216, BY163297, BY209582, FT25136, Y53085, BY87868, Y78979 to tree; added BY162441, BY162771, BY162854, FT19708, FT25820, FT19419, FT22284, FT24980, FT27218 on 1 April 2019. Added Z45540 to tree; added FT19312, FT20505^^, FT22497, FT23102, FT23465, FT26414, A621.2, A2223.2, Y83293, Y103063, Y108917, Z17782, Z17784, BY171143, FT20172, FT20195, FT20196, FT20206, FT21525, FT21734, FT22978, FT24166, FT24306, FT26991 on 2 April 2019. Added Y28768, Y18765, BY130347, to tree; added Y61272, Y74324, Y75029, Y75250, Y76703, Y78095 on 3 April 2019. Added BY142084, FT27415, FT28835, FT29099, FT29428, FT29483, FT29847, FT30008, FT30062, FT31067, FT31275, FT31750^^, MF33069.2, Y58511.2 BY87545, BY142071,BY64222, BY70416, BY139344, BY143819 on 4 April 2019. Added BY73069, FGC74134, FT31911, FT31914, FT31915, FT31921, FT32260, FT32401, FT32430, FT32437, FT32456, FT32466, FT32485, FT32491, FT32528, FT32531, FT32558, FT32578, FT32609, FT32660, FT32665, FT32761, FT32794, FT32852, BY102306, BY125525 on 5 April 2019. Added BY54510, BY125113, BY181111, FT28866, FT28997, FT29014, FT29155, FT29411, FT29488^^, FT29722, FT29893, FG29923, FT29936, FT30130, FT30250, FT30403, FT30466, FT30838, FT31003, FT31062, FT31346, FT31417, FT31745^^, FT31766 Y57313, Y58495, FT31441 to tree investigation; added Z39373, BY15371.2/FGC11817.2, BY125201, BY134713, FGC41764.2, Y45819, Y46620, Y48713, Y49299, Y50745, Y52215. Y52765, Y53120. Y53998, Y54407, Y55501, Y56137, Y56222, Y57122, Y57699, Y58594, Y59801, Y105529.2, ZQ825.2, FGC25432.1/V4463.1 on 6 April 2019. Added BY62723, FT34793, FT34806, FT35250, FT35520^^, MF82285.2 on 7 April 2019. Added FT24243 on 8 April 2019. Added BY66307, BY169853, BY200144, FT13371, FT33758, FT33798, FT33834, FT33866, FT33922, FT33986, FT34410, FT34419, FT34420, FT34453, FT34604^^, FT34690, FT34697, FT34778, FT34838, FT34854, FT34885, FT34903, FT34978, FT34983, FT35046, FT35047, FT35067, FT35097, FT35134, FT35144, FT35273, FT35297, FT35316, FT35333, FT35355, FT35362, FT35415, FT35469^^, FT35506, Z7052, Z7055, Z7148^^, Z3952, Z18145, Z3961, K692^^/Z7188^^, K693^^/Z7193^^, Z7204^^, Y125467, V5195^^/Z7217^^, Z4011^^,Z7779^^, Z7783^^, V6603/Z7865, V6604/Z7866, V7609/Z4065, Z7967^^ on 10 April 2019. Added BY63384, BY96718, BY150361, FGC42208, FGC48565, FT5753, FT38089, FT38106, FT40257, FT40270, FT40292, FT40360^^, FT40373, FT40440, FT40559, FT40590, FT40809, FT41225, FT41388, FT41437, FT41488, FT41731, FT41914, FT42184, FT42286, FT42409, FT42485, FT42523, FT42525, FT42665, FT42667, FT42764, FT42824, FT42839, FT42892, FT42959, FT43305, FT43413, FT43485, FT43590, FT43638, FT43642, FT43661, FT43966, FT44465, FT44482, MF11091.2 on 11 April 2019. Added BY51881, BY55245, BY55540, BY65346^^, BY77414^^, BY77861, BY80897, BY87725, BY107715, BY114349, BY148400^^, BY151329, BY157215^^, BY212767, FGC76894/Y95709, FT36894, Y82519, Y82548, Y82597, Y83182, Y83332, Y83488, Y84027, Y84516, Y85071, Y85672, Y85875, Y85947, Y86002, Y86016, Y86051, Y86435, Y86449, Y86697, Y86839, Y86841, Y87141, Y87960, Y88325, Y88956, Y89094, Y89219, Y89521, Y89813, Y90296, Y90751, Y90960, Y91277, Y91431, Y91816, Y92212, Y92268, Y92344, Y92981, Y95186, Y95953, Y96004, Y96257, Y96388, Y96465, Y96511, Y96716, Y96804, Y97097, Y97438, Y97636, Y98412, Y98674, Y99052, Y99388, Y100764, Y101273, Y101519, Y102117, Y102172, Y102276, Y102608, Y102847, Y102909, Y103113, Y103556, Y103708, Y104063, Y104120, Y104459, Y104584, Y104905, Y105085, Y105161^^, Y105310, Y105387, Y105999, Y106088, Y106518, Y106626, Y106714, Y106999, Y108011, Y108091, Y108515, Y108973, Y109361, Y109850, Y109851, Y109884, Y109985, Y110004, Y111503, Y111560, Y111601, Y111800, Y111935, Y112492^^, Y112872, Y113315^^ BY51881, BY55245, BY55540, BY65346^^, BY77414^^, BY77861, BY80897, BY87725, BY107715, BY114349, BY148400^^, BY151329, BY157215^^, BY212767, FGC76894/Y95709, FT36894, Y82519, Y82548, Y82597, Y83182, Y83332, Y83488, Y84027, Y84516, Y85071, Y85672, Y85875, Y85947, Y86002, Y86016, Y86051, Y86435, Y86449, Y86697, Y86839, Y86841, Y87141, Y87960, Y88325, Y88956, Y89094, Y89219, Y89521, Y89813, Y90296, Y90751, Y90960, Y91277, Y91431, Y91816, Y92212, Y92268, Y92344, Y92981, Y95186, Y95953, Y96004, Y96257, Y96388, Y96465, Y96511, Y96716, Y96804, Y97097, Y97438, Y97636, Y98412, Y98674, Y99052, Y99388, Y100764, Y101273, Y101519, Y102117, Y102172, Y102276, Y102608, Y102847, Y102909, Y103113, Y103556, Y103708, Y104063, Y104120, Y104459, Y104584, Y104905, Y105085, Y105161^^, Y105310, Y105387, Y105999, Y106088, Y106518, Y106626, Y106714, Y106999, Y108011, Y108091, Y108515, Y108973, Y109361, Y109850, Y109851, Y109884, Y109985, Y110004, Y111503, Y111560, Y111601, Y111800, Y111935, Y112492^^, Y112872, Y113315^^ to tree; added FGC26313.2^^, FT36625^, FT36795^/Y168347^, FT36836^/Y168346^, FT36852^, FT36956^, FT36974^, FT37196^, FT37366^/Y168353^, FT37667/Y168348, FT37942^^, MF78119.2^, Y93811^, FT36417, FT36645, FT36678, FT36882, FT36892, FT36898, FT37166, FT37281, FT37317, FT37640, FT37736, FT37765 on 14 April 2019. Added Y88376^^, Y88416^^, Y168350, Y168349, Y5611.2, Y37640, Y1399.2, Y107627, YP415.2, BY68743, BY87342, BY87342, BY88028, BY92601^^, BY96426^^, CTS7551.2/F3708.2/L667.2/M2226.2, FT38083, FT40779, FT40987, FT40996, FT41797, FT42297, FT42377, FT42616, FT42833, FT43123, FT43155, FT43271, FT43322, FT43613, FT43671, FT43737, FT43825, FT43901, FT44254, Y108386, Z36595.2 on 15 April 2019. Added BY54306, BY67103, BY68035, BY69340, BY70580, BY70969, BY70984, BY71580, BY73787, BY75961, BY76426, BY79318, BY79551, BY90087, BY91963, BY92940, BY96398, BY99375, BY105282, BY107566, BY107723, BY108481, BY109656, BY113441, BY116063, BY135645, BY137547, BY140930, BY145265, BY145396, BY145526, BY149670, FT40287, FT43168, FT43468, FT44358^^, Y51007, Y130324, Y146550, ZS3311.2 to tree; added FT40475, FT42550, FT43516, FT43903 on 16 April 2019. Added BY76381, BY79060^^, BY120391, BY145224, BY148955, added Z31428, BY21521, BY21522, BY21523, BY21524, BY21525, BY21526, BY21527, BY21528, BY21529, BY21530, BY21531, BY21532, BY21533, BY21534, BY21535, BY21536, BY21538, BY21539, BY21540, BY21541, BY21542, BY47532, BY69608, BY69906^^, BY81231, F18801.2, FT42958, Y140835, Z31431 on 17 April 2019. Added FGC7593, FT41387, FT42720, FT43761, BY54644, BY69186 to tree investigation; added FGC1093, FGC1106, FGC1110, FGC1113, FGC1114, FGC1115, FGC1118, FGC1120, FGC1121, FGC1125, FGC1127, FGC1131, FGC1132, FGC1133, FGC1135, FGC1136, FGC1138, FGC1139.2/SA12.2, FGC1141, FGC1145, FGC1146, FGC1148, FGC1149, FGC1152, FGC1153, FGC1155, FGC1157, FGC7593, ZS9156.2 to tree on 18 April 2019. Added BY53999, F11396/PH1160, F11453/PH1316, F12086/PH2691, F12380/PH3539, MF1854^^, MF1855^^, MF1856^^, MF1857^^, MF1874, S10738.2, Y86052, Y88318, Y91103, Y91142, Y91428, Y94254, Y95386, Y96002, Y100186, Y104196, Y104692, Y106101, Y106254, Y108611, Y113027, Y113308^^ on 19 April 2019.